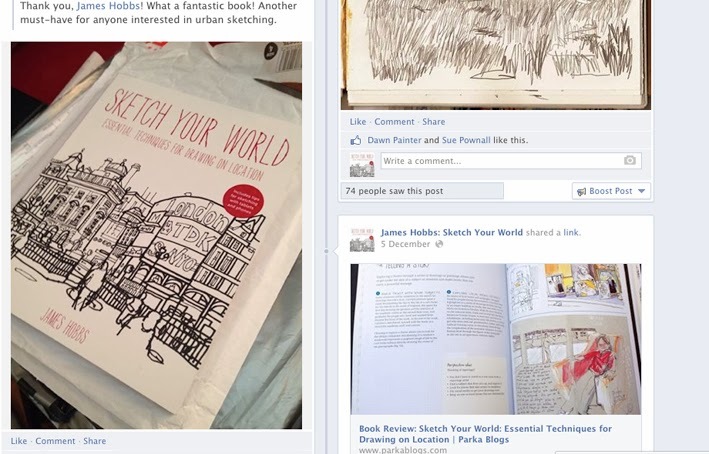 OK, so I haven't been quick to embrace the world of Facebook, but my forthcoming book Sketch Your World (published in the UK on 2 January 2014 and in the US on 10 January 2014), now has its own page. I'll be posting more information there as I get it, so please visit, like it (if you do), and say hello. I have digital prints of my work on sale at Skylark Galleries, Oxo Tower Wharf, on London's South Bank, until 31 January 2014 (closes 3pm on Christmas Eve), and two small paintings in a selling group show of postcard-sized works (including this painting, Return: Devon to Paddington, above) at the Frame Factory, Cross Street, Islington, London N1 2BG, also until 31 January. Beckmere and Runtzmere, the two ponds in Clissold Park, Stoke Newington, are named after two men who helped save the grounds of the old house from the developers 125 years ago. Well done, those men, I can't help thinking from this contemplative spot. 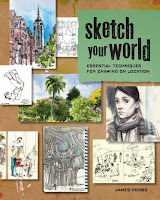 The Asian English edition of Sketch Your World, published by Page One, is already available, I've been informed. 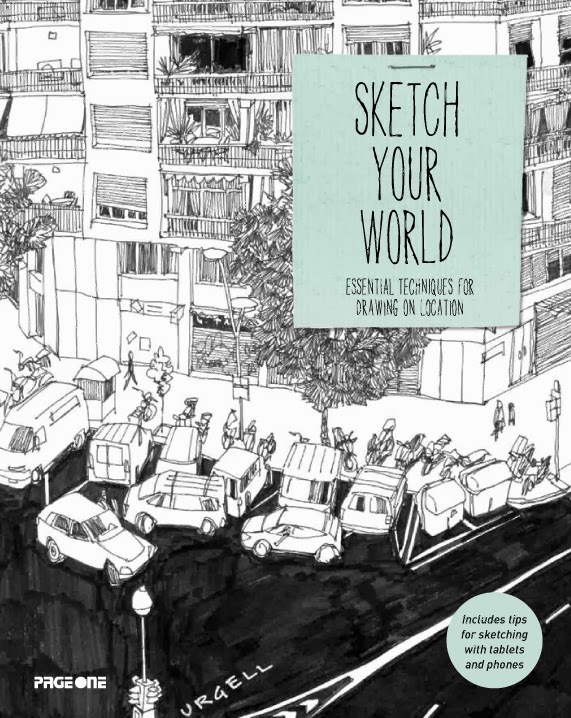 It has another cover, making a set with the US and UK versions, and features a drawing by Spanish Urban Sketcher Miguel Herranz from his Barcelona apartment. I like this drawing. You can see a review of the book, and a video flip-through of its pages (there really has to be some publishing term for this) at Parka Blogs. There's more about Miguel and his work here. Drawn from the departure lounge of Pescara airport, Italy, looking out on the low clouds and snowy mountains of Abruzzo, and thinking of my late friend, Jon Young, and his family who I had just visited, a few hours away to the north. 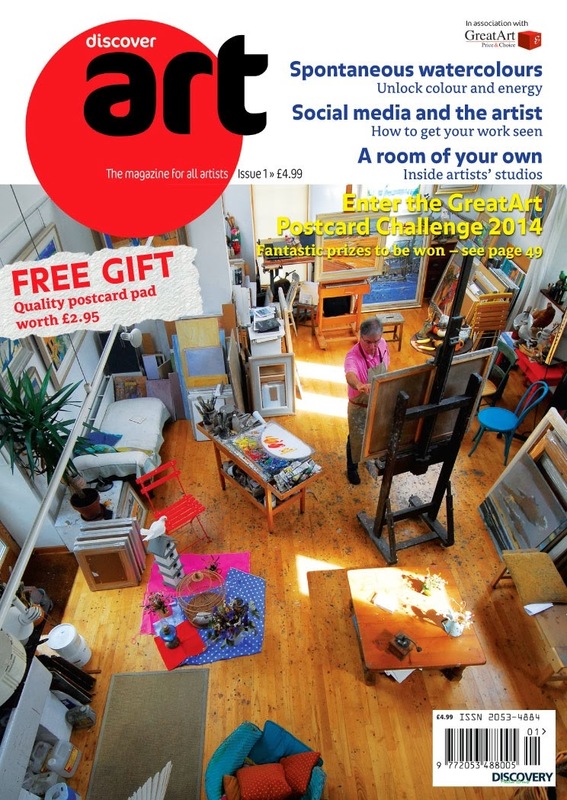 Discover Art, a brand new 116-page magazine for artists, is available in WHSmith and all good newsagents from 15 November — or maybe you've already picked up a copy at the Art Materials Live show at Birmingham's NEC, which runs from 7 to 10 November 2013. 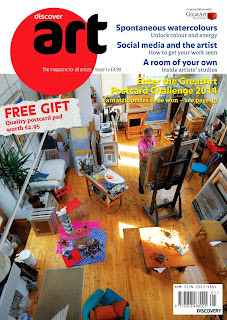 This issue, edited by me and available through much of next year, includes interviews with BP Portrait Award winner Susanne du Toit and Olympic digital artist Tim Vyner, highlights the work of a variety of artists in different media, offers advice by top blogger Katherine Tyrrell on social media for the artist, looks inside the studios of a variety of artists, and gives the opportunity to win a five-day painting holiday. All — and more — for £4.99. 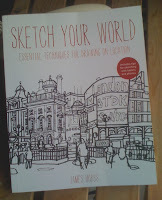 An advance copy of Sketch Your World has arrived at my door. It contains the work of about 60 international artists, including mine, and is due to be published in the UK and US in January (they have different covers, shown here). 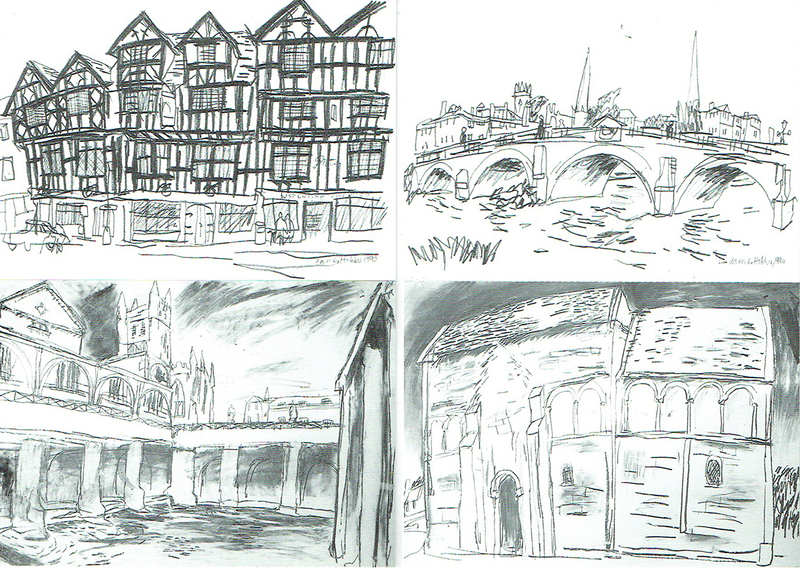 I'll say this more than once, but my thanks again to the artists who kindly let me use images from their sketchbooks. 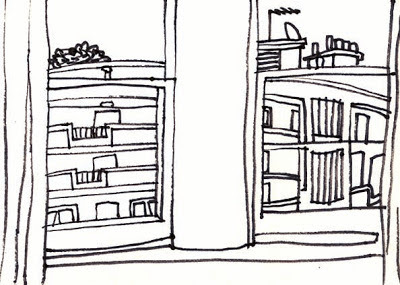 A few of them are familiar faces from Urban Sketchers, but most are not. One of the most enjoyable elements of writing the book was selecting drawings by some of my favourite sketchbook artists. I will post a list of links to all the contributing artists in time. Did I say how happy I am with the way it has turned out? I have now. My thanks to the great team at RotoVision who made this come about. I'll blog and tweet more about the book nearer to publication time. 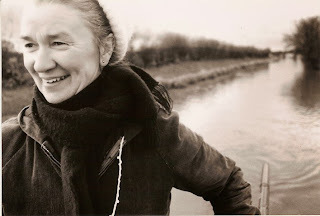 The Guardian has published an obituary of my mother, who died in the summer. Its "Other Lives" obituaries feature people who may not have been well known, but who have made a difference (which we all do, really). 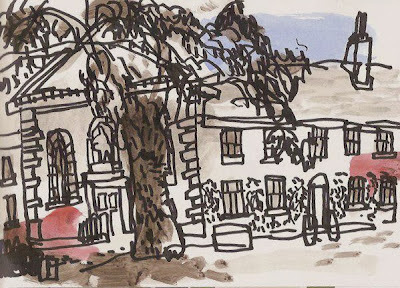 Newfoundland urban sketcher Joy Hecht was in London the other week, which prompted an afternoon's drawing group that meandered from the Museum of Childhood in Bethnal Green to the Geffrye Museum in Hoxton. 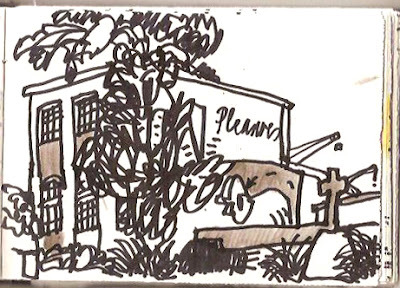 Fellow cyclist and artist Olha Pryymak and I sat and drew in the gardens of the old almshouses waiting for the rest of the group to gather, at which point we all headed for the cafe. 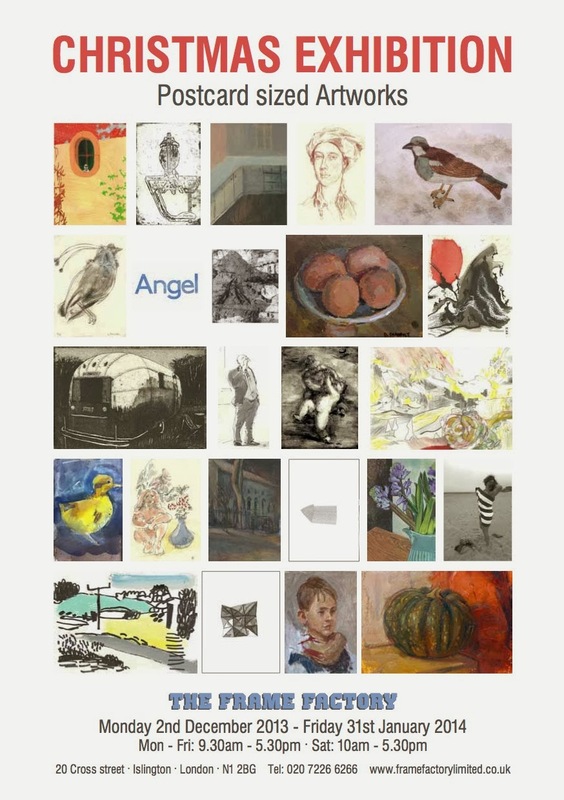 It's the Big Draw month (until 3 November) in the UK – and 14 other countries. There's a lot of drawing going on around the place currently. This is how it should be, to be honest. Scenes from the Paddington to Devon train. My brother Simon and I are cycling 52 miles on Sunday 16 September on the London Bikeathon in aid of Leukaemia & Lymphoma Research – along with about 7,000 other cyclists. Interested in sponsoring us? In case you are, here is my JustGiving page to make it easy and to tell you a bit more about why we are doing it. If you can't, just think beautiful thoughts on Sunday. The empty chair of my late mum. Long life to Dad! I met up with Urban Sketchers Pete Scully, Sue Pownall, Dave Black, Olha Pryymak and Evelyn Rowland – and many more – at Pete's sketchcrawl around Whitechapel and Spitalfields this week, some of them fresh from the USk symposium in Barcelona. London is still reeling from having a summer on its hands – a novel concept and the first in living memory for many – meaning that the conditions were in stark contrast to the sketchcrawl last winter at Tate Modern when temperatures were sub-zero and huskies were compulsory. Pete's route took in a variety of places related to Jack the Ripper, the serial killer in 1880s London, ending up at the Ten Bells pub in on Commercial Street, where we compared drawings and supped restorative liquids, next to Hawksmoor's fantastic Christ Church Spitalfields. It's a part of town that is culturally rich, creative, graffiti-adorned, historic, poor and beautiful. It isn't perfect, but it's exactly what makes London such a great place. The East End has a lifetime of drawing in it – and that's why it was a great place for Pete to arrange a sketchcrawl. 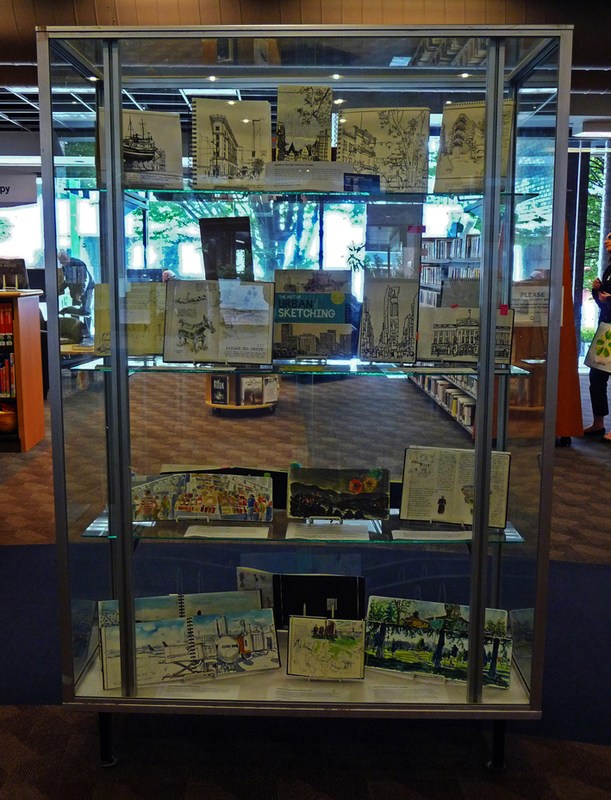 The exhibition of sketchbooks in Victoria, BC, Canada, has moved on from Oak Bay library to the city's Central Library, where it will be on show until the end of this month. Two of my sketchbooks are on display, along with those by Gabriel Campanario (Seattle), Virginia Hein (Los Angeles), Sigrid Albert (Vancouver), Luis Ruiz (Malaga), Kumi Matsukawa (Tokyo) and Matthew Cencich (Victoria), who curated the show. There's more about the earlier show here. 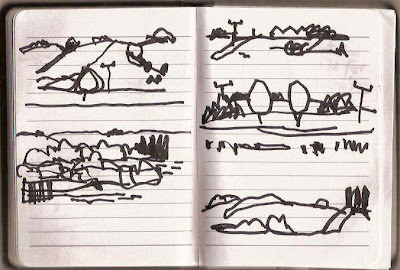 There is something stimulating about drawing from a moving train, as I did on recent trip from London to Devon. 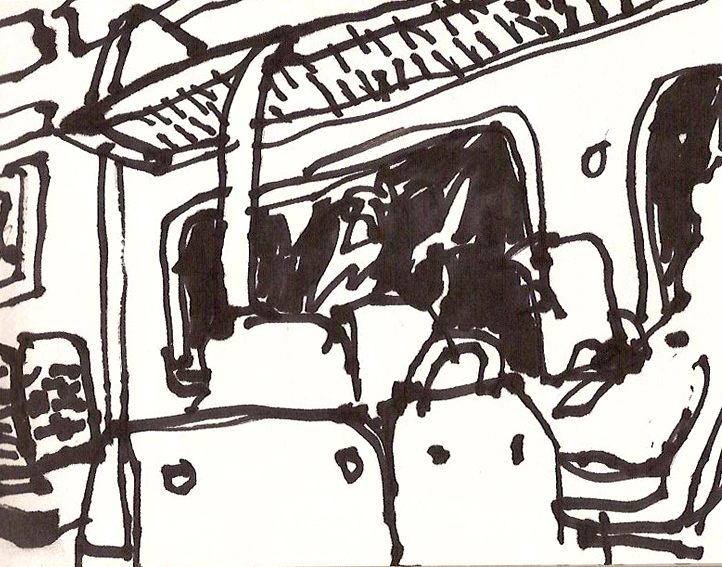 It is quiet time, perfect for getting out a sketchbook, but I can get tired of drawing the carriage scenery and fellow passengers. 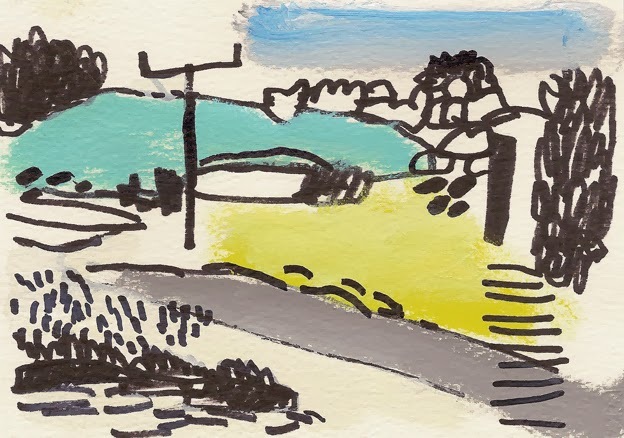 Drawings of the fleeting landscape can only take a few seconds: there is little that is constant or unchanging about the landscape on the Paddington to Exeter route, at least. The focus jumps to and fro, and you just have to sit and wait until an interesting view comes along for a few seconds or so, and make the most of it when it does. 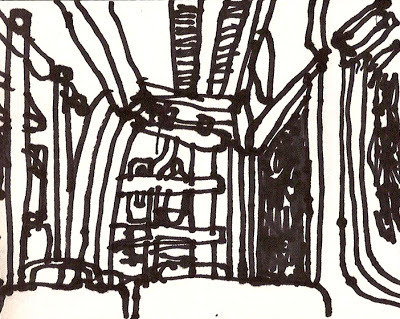 I used a combination of sketchbook drawings to make this one, on a small canvas (about 12x15cm) with acrylic and marker pen, using a process of drawing and painting sections out until something emerged. It is the first time I've tried this. It won't be the last. There are probably — in fact, I know there are — lovely bits of Vauxhall tucked away behind the transport maelstrom in its centre. Buses, trains and cars battle it out. A helicopter even fell from the sky here recently, with tragic consquences. Cyclists have to take a back seat, to pick a bad metaphor. It's a landscape that has gone very wrong, and yet it's somehow very appealing to draw. 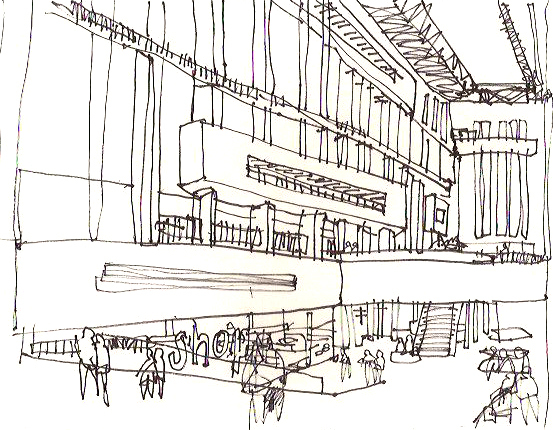 Drop in on Gabriel Campanario's The Week in Sketches, which features a selection of drawings from around the world. One of mine is among today's [when it was called The Day in Sketches], Tuesday 18 June — along with some by my favourite sketchbookers. 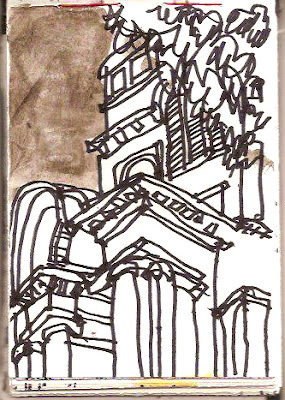 Canadian urban sketcher Matthew Cencich has curated a small show of sketchbooks at a local library in Victoria, British Columbia, and included a couple of my London sketchbooks among those by six other international artists: Gabriel Campanario (Seattle), Virginia Hein (Los Angeles), Sigrid Albert (Vancouver), Luis Ruiz (Malaga), Kumi Matsukawa (Tokyo) and Matthew Cencich (Victoria). All the books are around A5 size, so it is good to see the drawings at their actual size, rather than as variable images on our screens and tablets. 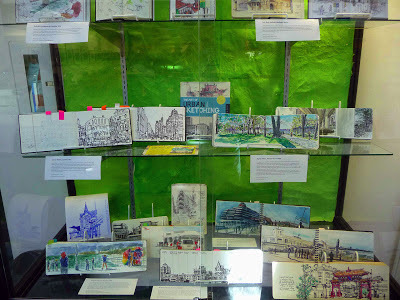 And I can't help thinking that libraries, those most fantastic of places, are a great place to exhibit sketchbooks. The books are showing at the Oak Bay Library, 1442 Monterey Avenue, Victoria, BC, until 30 June. 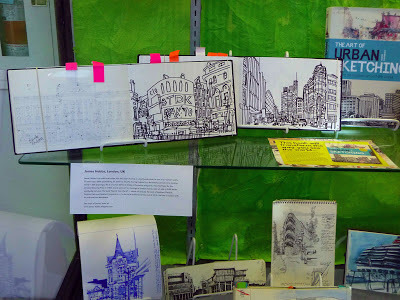 There's a post by Matthew about the display on the Urban Sketchers blog. As it happens, I did use quite a bit of the kit I took on my recent cycling trip, urged on by a tweet sent by Gabi Campanario: "We all need freedom from the tyranny of our most common sketching tools." I usually take a pen and a sketchbook and find that this is more than enough, but I squeezed a few more things into the panniers last week, and this had a liberating effect. Sometimes things can seem more complicated than they really are. The National Cycle Network Route 1 between Newcastle and Edinburgh is great, with sections off-road and never too far from the sea. Around the Druridge Bay Country Park, with the sun shining, it was spectacular. The only "traffic" and sense of urgency came from birdspotters — on foot — who were on their way to see a great reed warbler that had been blown off course and spotted nearby. The Northumberland coastline is fantastically unspoilt and free from major inclines. The wind turning around to blow from the north didn't help — pedalling downhill isn't what you expect to have to do — but the rain held off, and the pub lunches and the occasional pit-stop in a cafe en route helped keep us going. There was even time before the train home from Edinburgh for a quick whiz around the David Batchelor exhibition at the Fruitmarket Gallery (until 14 July). 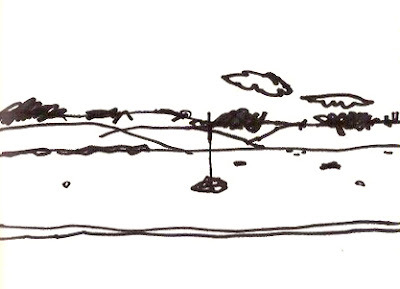 It's titled "Flatlands", a name to gladden this cyclist's heart. 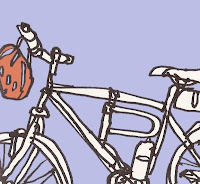 I'm about to leave for a few days of cycling, and although there's not too much space in the panniers, what do I need to take apart from a few bits of clothes and some things to draw with? 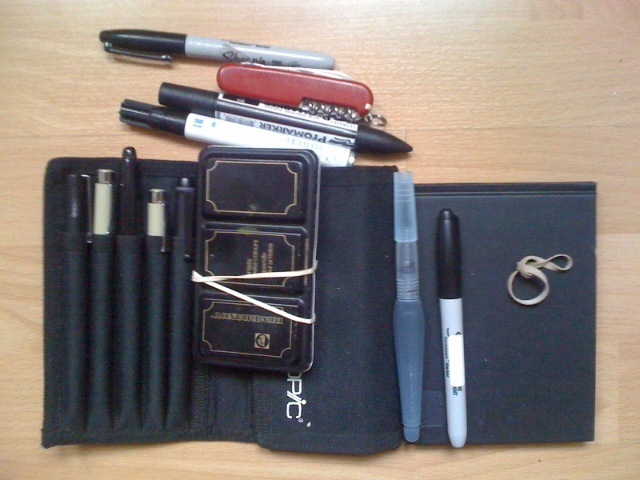 I make a small pile of equipment to take - except I have this sneaking feeling that I'll end up using what I usually do: a thick black pen and a sketchbook. I like how pared down and simple these two are: black on white has an enduring appeal for me. The pile I intend to take is hardly extravagant — look at it. Taking a waterbrush and watercolour set is hardly going overboard, but how much will I actually use? The eyecatching feature of the Walkie-Talkie, at 20 Fenchurch Street, is that it curves outwards towards its top, so the highest floors are larger than those lower down, giving it the appearance of a giant telephone receiver popping up through the city's buildings. Designed by Rafael Viñoly, it is due to open in April 2014, and while most of us usually have to make do with the external appearances of towers in the financial district, this time there will be a "skygarden" open to the public. The plan is that it will be free, but require advanced booking. We'll see how that goes. Would it have received approval without the garden? 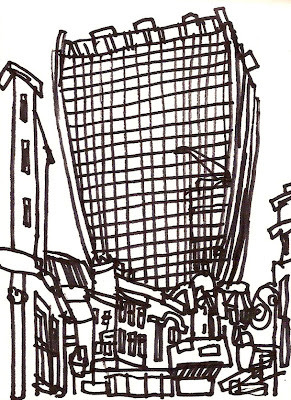 At 38 floors, the Walkie-Talkie is hardly the world's tallest (the Burj Khalifa has 164), or even London's (it barely makes it into its top 10), but it looks as if it will have an overpowering presence on the scrum of tall buildings north of London Bridge. The crowd is getting thicker. Old friends—and enemies—are getting lost in the midst of it. I stopped by St Paul's Cathedral on the way back from work yesterday to draw while preparations continued for the funeral of Margaret Thatcher later today. 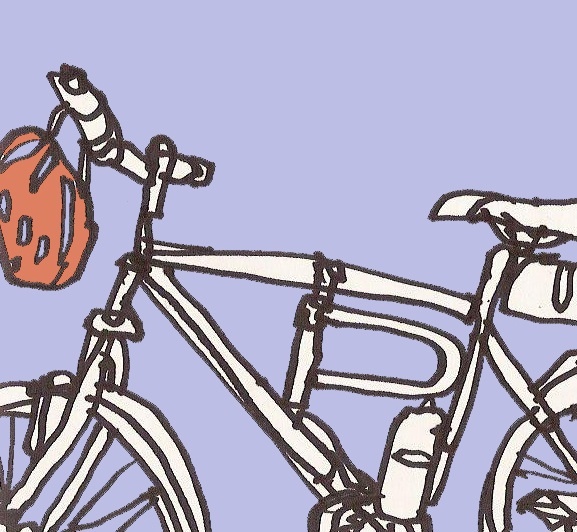 I drew this still astride the bike, helmet and cycling clips still on: this, I find, encourages a focus on the essentials. The train west from London through Devon follows the west bank of the River Exe, and then along the coast for several miles, and then along the north bank of the River Teign. It's a kind of constant and yet continually changing view out of the windows on the left hand side of the train. 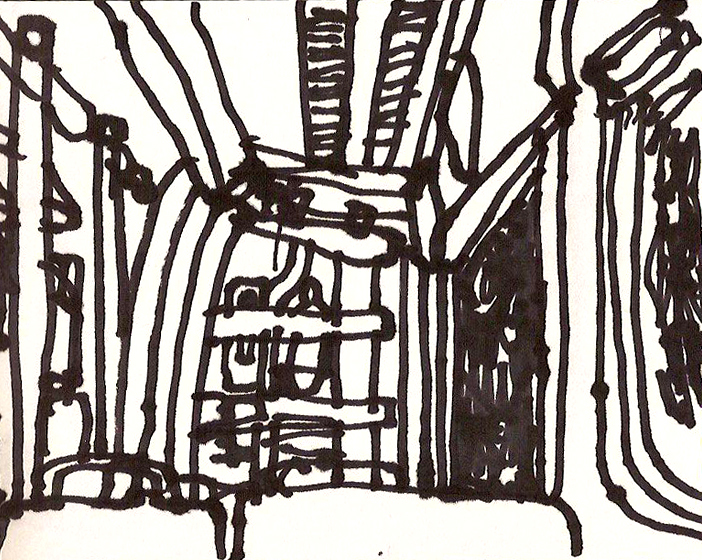 To draw this is to try to portray an amalgam of a specific place. The boat in the middle of this (above) started as a buoy, and then morphed from dinghy to whatever it looks like now. Is it a yacht? 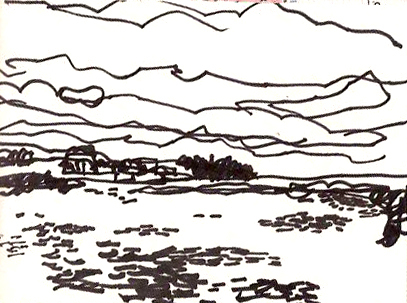 The drawing below, of the view towards Exmouth as the train neared Dawlish Warren, was more about the sky. I was interested in how Rolf Schröter drew clouds from a German train, as the sky is often the least changing element of the scene out of a train window. I like Rolf's work a lot. It's a view I've seen a lot of lately; I turn my head left now, and that's what I see. I like this view. 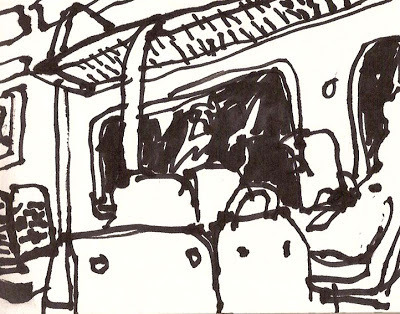 A quiet journey home to London on the train from the south coast one evening last week, watching the congested platforms filled with commuters on their way home in the opposite direction, as darkness falls outside. It wasn't ideal weather for a sketchcrawl yesterday, but it was handy having Tate Modern at hand to warm up in, while the temperatures outside struggled to reach freezing point. The vast new underground, windowless Tanks were showing William Kentridge's I Am Not Me (which closes today). It was dark, I couldn't see what I was drawing, and fellow viewers got confused with the silhouettes of Kentridge's eight-channel video work. A great space though. I like it in there. 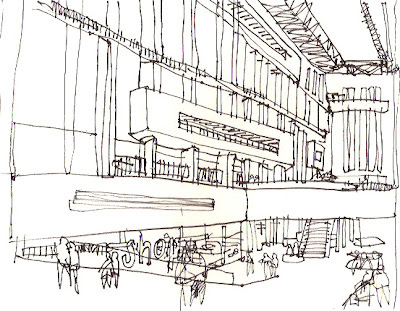 The next London Urban Sketchers sketchcrawl coincides with the 38th Worldwide Sketchcrawl on Saturday 19 January 2013, meeting at midday at Tate Modern's Turbine Hall, and going on until 5pm. 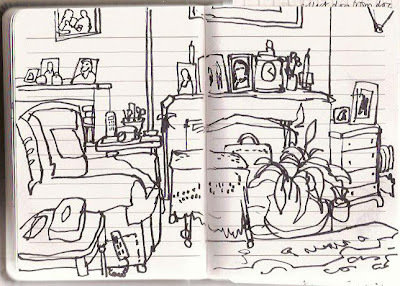 Meanwhile, all around the world, people are doing the same in their own cities, sketchbook in hand. What could be better than that? 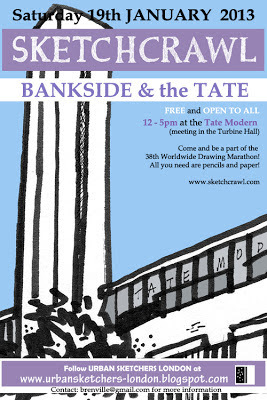 You just come with your drawing kit, pay no money, draw, and chat with other people who are doing exactly the same. It's a relaxing thing. Inside or out, there's plenty to draw around Bankside. Need more info? 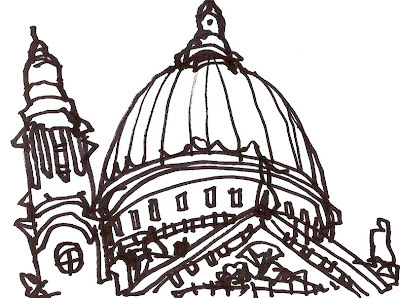 See the London Urban Sketchers website, or the London Sketchcrawl Facebook page.